Pets have an instinctive fear of new surroundings, so pet owners will want to help them adjust quickly after moving to a new home. 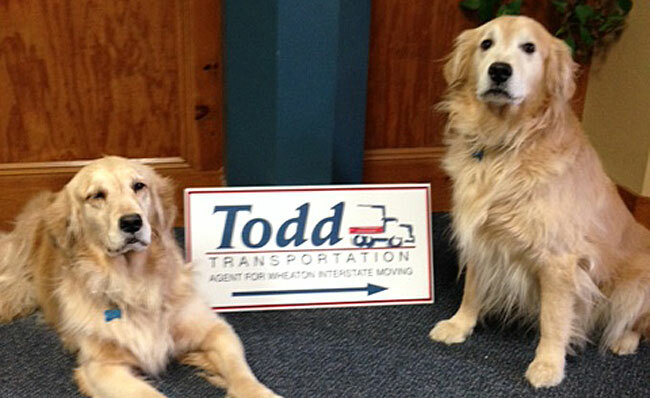 Todd mascots Hunter and Daisy share the following tips to help you do just that. Pets cannot be shipped on moving vans. Pets often become frightened and may try to run away. Keep your pet on a leash when outside. Your pet should wear a special identification tag with its name, your name and where you can be reached. Consider sending smaller pets by air express. Consult with your veterinarian concerning mild sedation of your pet during the trip. If your move is across state lines, check with your new State Veterinarian or State Department of Animal Husbandry. A good place to start is the U.S. State and Territory Animal Import Regulations website. Interstate health certificates must be obtained for dogs and horses prior to entering most states. States require a rabies vaccine for dogs and many require it for cats. Hawaii requires that cats and dogs be quarantined for 120 days. Some pets must have an entry permit issued by the destination state’s regulatory agency. A few states have border inspection of all animals being transported; others have random inspections. Be sure to check your local community laws. Some communities have pet control and licensing ordinances. In some cases, the number of pets is limited. Make reservations well in advance. Follow airline instructions. Obtain a shipping container a week or two in advance. Familiarize your pet with it by placing the pet in it for a few minutes each day. Gradually lengthen the time until the pet seems to be at ease with it. Carefully schedule boarding and shipping arrangements for your pet to assure that the pet is well cared for until you are able to receive it at your new home. Feed the pet no less than five or six hours before flight time. Give the pet a drink of water no less than two hours before the flight. If your pet is accompanying you, arrive at the terminal 45 minutes before normal check-in time. If shipping the pet, get to the freight terminal two hours in advance of the flight. Be certain that names, addresses and telephone numbers of people responsible for the pet at origin and destination are clearly marked on the container and on the pet’s identification tag. Notify the person receiving the pet that it is on the way. Give them the flight and waybill number. Pets can usually be picked up within 90 minutes of flight arrival. If your dog or cat is not used to traveling by car, make short trips with the pet a week or two in advance. Dogs should be taught to lie quietly. Don’t let your dog put its head in the wind as that can irritate its eyes and cause problems. Cats are often frightened by car travel, but they usually adjust quickly. Folding kennels or crates especially designed for minivans can be very useful. Get your pet accustomed to being on a leash and always use it when outside your vehicle or hotel. If you must stop overnight, check in advance for hotels that allow pets. Be sure that your pet is properly tagged and its rabies tag is firmly attached. Pet travel kits should include the following: food, water, dishes, leash, treats, favorite toy, some type of bedding and a can opener (if needed). To be on the safe side, ask your veterinarian if a sedative would be appropriate. Don’t forget the scooper and plastic bags for cleanup!